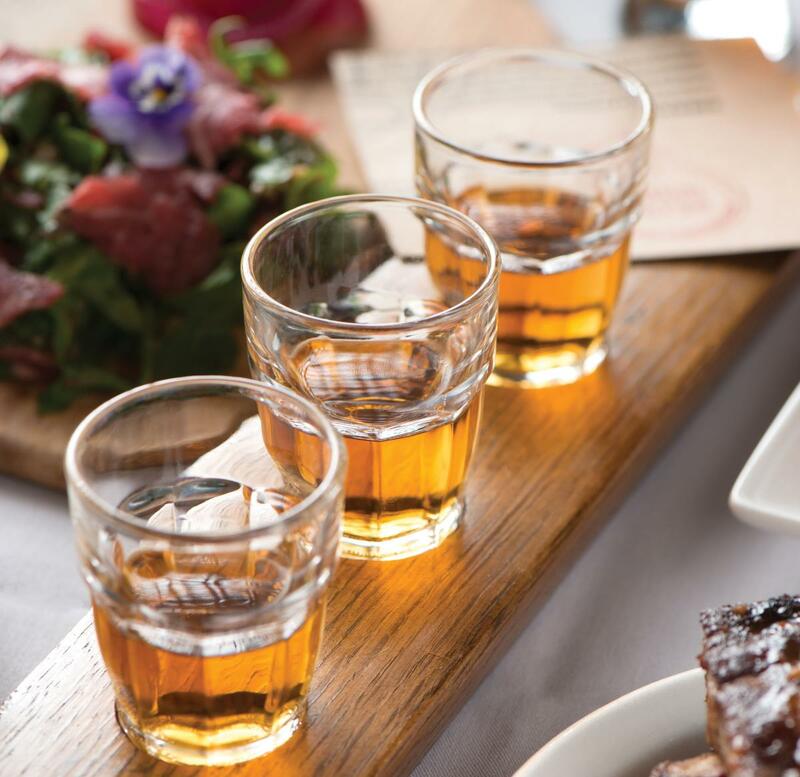 Warm your spirits and expand your palate with a whiskey-tasting flight. Above: A Bourbon flight from Radish & Rye. Photography by Douglas Merriam. Don’t be confused by the name: Radish and Rye does stock a lot of rye, but this farm-to-table restaurant in Santa Fe actually offers more than 100 American whiskeys, including locals such as the Colkeegan single malt from Santa Fe Spirits and Turley Mill from Taos Lightning. Sure, you can come in just for a drink, but that would be a missed opportunity. Chef Dru Ruebush has designed a menu full of dishes—like grilled pork chops with bacon and polenta—that highlight the smoky, earthy flavors of bourbon and rye. Start your meal in the bar, where you can nibble on a small plate of smoked ribs, lamb pâté, or fingerling potatoes fried in duck fat and spend some time deliberating over the 14 different American whiskey flights. Each comes with three -ounce pours, enough to explore the flavors but not enough to knock you off your barstool. Some flights show off a particular style, such as small-batch or single-barrel selections. Others offer a sampling of a distillery’s portfolio: Shown here is a Buffalo Trace Distillery flight featuring the Kentucky company’s signature blend, along with its 10-year-old Eagle Rare and Elmer T. Lee single-barrel bourbons. Don’t leave without looking at the dessert menu. You’ll be surprised by how well a snort of Old Foster Original Batch goes with a slice of Kentucky butter cake.